I know most of you think ahead and plan your meals WAY in advance, right? I'll give you the benefit of the doubt and assume you aren't like me, with your head in the freezer almost every night, trying to figure out the quickest way to fill your family's bellies before bed. However, if you DO end up falling back into your procrastinating ways and find yourself thinking "dang it, I wish I would have thrown some chicken in to marinate last night! ", please refer back to this article. I am going to show you a quick and easy recipe for marinated chicken that you can prepare with stuff you will always have on hand (yes, even the fresh ginger, I'll share my secret for that as well). I like to get the individually frozen chicken breasts for a quick-thawing dinner option, so this recipe is a great one to memorize and experiment with for some last minute flavor infusion. This marinade will insert some delicious flavor into those bland chicken breasts or pieces in as little as an hour. Of course, to get even better flavor, let the chicken marinade for up to 4 hours, but not much longer than that so that it doesn't become overpowering. One of the cornerstones of this recipe is the Sriracha sauce. Never heard of it? It is a Thai hot sauce that packs a lot of garlic and a pretty good kick (actually, a mule-to-the-chest-kick, but try these chicken wings if you like the sauce). I love it in this marinade because aside from the heat, it brings a lot of garlic to the party, which keeps me from having to mince some fresh garlic. Just one less step and ingredient I have to keep on-hand. If you want your marinated chicken to have a really good kick, just double the amount of sriracha sauce. Sound interesting? Good, let's get to it. 1This amount of marinade is good for about 4 chicken breasts or thighs. I like to buy fresh ginger root and freeze it in Ziplock bags. When you need it for a recipe like this, just use the edge of a spoon to scrape off the paper-like skin and then grate the frozen ginger into a bowl using a Microplane, or other fine grater. 2Mix the ginger, soy, sriracha, sesame oil and vinegar together in a bowl and whisk thoroughly. It will take some whisking to get the honey to combine. You can always heat the marinade to melt the honey, but make sure you cool it to room temperature before you start marinating your chicken. I usually just mix it well and scrape any remaining honey into the bag with the chicken and mix things around again in there. 3Place the chicken in a sealable bag and pour in the marinade. 4Squeeze as much air as you can from the bag, seal it and place in the refrigerator until you have your grill ready for cooking. 5After an hour, you now have the makings for some amazingly awesome marinated chicken, now we just need to apply the flame! 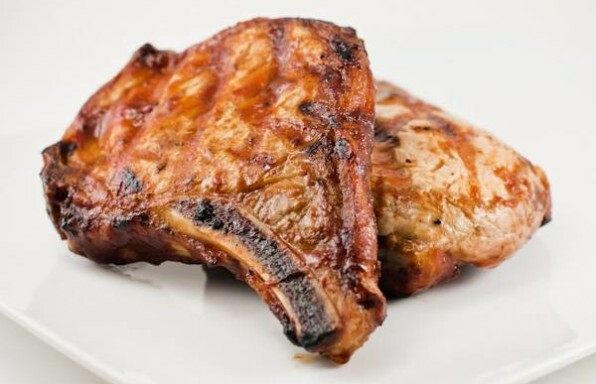 Go heat up that grill to medium-high heat and let's get dinner going. 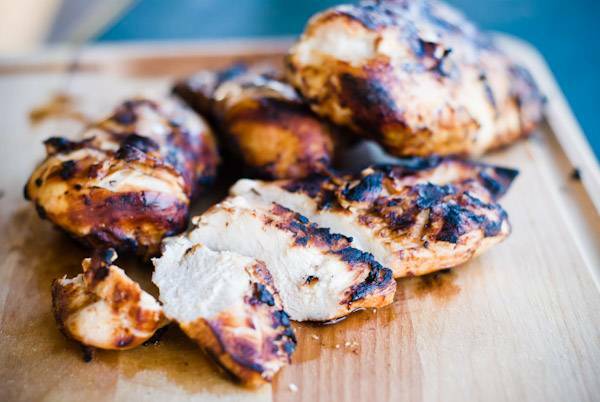 6Once the grill has preheated, remove the chicken from the marinade and shake off any excess. Place over the hottest part of the grill. 7Grill the marinated chicken for about 6 - 8 minutes on each side, until a good instant-read thermometer reads 165 degrees. 8Serve your easy marinated chicken over a salad or next to something green and delicious and enjoy!